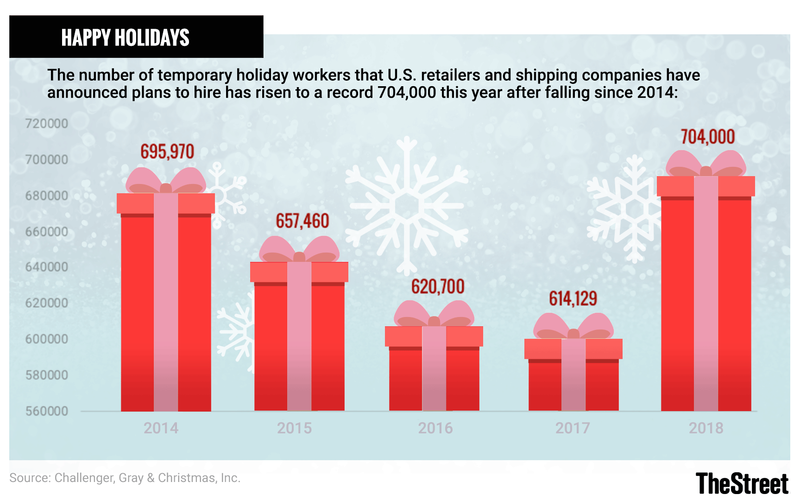 Hiring for the holidays is the highest in years, just as the nation's unemployment rate plummets and retail giants such as Amazon eye bringing massive numbers of seasonal workers, according to a global job placement firm. Retailers such as Target plan to hire huge numbers of seasonal workers for the holidays amid tight unemployment. Hiring for the holidays is the highest in years, just as the nation's unemployment rate has plummeted and retail giants such as Amazon.com Inc. (AMZN - Get Report) eye bringing on massive numbers of seasonal workers, according to Challenger, Gray & Christmas, a Chicago-based global job outplacement and executive coaching firm. Leading the hiring push are Target Corp. (TGT - Get Report) - which plans to hire 120,000 workers - Amazon and United Parcel Service Inc. (UPS - Get Report) - which will each take on 100,000 workers, according to Challenger, Gray & Christmas. Hiring at FedEx Corp. (FDX - Get Report) also will be up for the holidays, with plans for 55,000 temporary workers. All this comes as the nation's unemployment rate fell to 3.7% in September and as Amazon is raising its lowest wage to $15 per hour. "It's going to be an enormous challenge" for retailers to lure the high number of workers, Andrew Challenger, vice president of Challenger, Gray & Christmas, told TheStreet on Wednesday, Oct. 17. "The demand for labor is as high as we've ever tracked ... and the labor market is as tight as it was in 1969." Comparing seasonal hiring to 2012 shows that Amazon then only planned to hire 50,000 workers and Target 88,000. Some retailers have started looking for help for the holidays as early as July, said Challenger, and many are looking for help in the "backrooms" - in the warehouses and logistics to support their online sales and not necessarily in stores, said Challenger. "Over the last three years retailers have been the No. 1 job cutters," he said, noting that they slashed cashiers and sales workers. But now, he said, they need help for cyber sales. While Challenger estimated that major retailers plan to hire a total of 704,000 new workers according to their own announcements, not all stores plan for such big investments. Hiring plans for J.C. Penney Co. (JCP - Get Report) and Macy's Inc. (M - Get Report) , for example, are nearly flat from five years ago.